Super Lenny is simple and stylish, but better than that, it has substance to back up its style. The online casino’s layout is interesting and the site’s mascot, a gentleman with the head of a deer, donned in a black tuxedo dares you to “deer to bet different”! 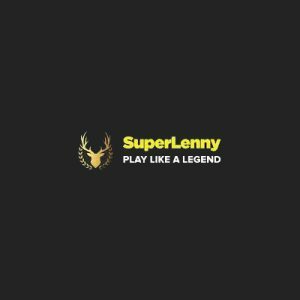 Since opening in 2014, primarily as an online bookie, SuperLenny online casino has grown and developed a solid reputation for being a great, reliable and trustworthy casino offering hundreds of games. Their consistency in delivering quality and service has made them into one of the most popular game portals and a favourite casino amongst players. SuperLenny is owned by Betit Operations, a Maltese company that has its own gaming platform called Everymatrix. The gaming selection is fantastic! With over 500 games to choose from developed by 16 software providers you’ll be able to play to your hearts content. SuperLenny is a great host and he values your presence at his casino. Sign up and register, pay your first deposit and you will receive a Welcome Bonus to make you feel very welcome indeed! In fact, there are two Welcome Bonus packages. The first one is for the sceptic who needs to try before they buy! The no deposit Welcome package is made up of ten free spins. This means that you will not need to use your own money to start playing the games. The casino offers you the opportunity of trying their offerings to see if you enjoy them before using your own money. The second Welcome Bonus, the more lucrative of the two, is divided into two payments: The first is a 100% match offer up to $/€ 50 and 50 free spins. For your second deposit you will receive a 50% match up to $/€ 100 plus another 50 free spins. What’s more, the casino adds a little something into the mix, after you’ve wagered $/€ 350 on the games, SuperLenny will award you another 50 free spins! There are no bonus codes to concern yourself with as when you make your first deposit, you have the option of ticking a box that states that you wish to have the bonus. At SuperLenny free spins are granted in the form of BUX, their very own special currency that is exchangeable for free spins. 1 BUX is equal to $/€ 0,1 and can be earned by making deposits and playing games. The casino also offers some interesting promotions designed for the player to accumulate free money, for example, the cash back Live Dealer Casino weekend offer is 10% of losses given back to the player, up to $/€ 100. Lenny’s Sunday tournament offers a prize of $/€ 500 to the player that earns the highest amount of points on the last day of the week. The points are awarded for every $/€ 10 spent on slot games and the top 20 players receive a prize of up to 150 Super Spins. SuperLenny accepts several payment methods so that real money gaming is convenient for everyone. The payment methods supported include the major credit cards, Visa and Mastercard, as well as Trustly, Neteller, Paysafe Card, SoFort Banking, Skrill, Zimpler and Bank Wire Transfer. All deposits are processed instantly and withdrawals have varying processing times; Credit and Debit cards can take between 3-4 days to be completed. The fastest way to receive your winnings is with e-Wallet, which will take up to 24 hours to be processed. The bank charges also vary, Visa, Mastercard and Maestro charge a 2.5% fee and Paysafecard charge 5%. The casino offers most of the major world currencies including the US dollars, Swedish kronor, British pounds sterling, Norwegian kroner, and the European Euro. Regarding wagering requirements for your Welcome Bonus, it’s set at 40x times the bonus amount. Always read the Terms and Conditions so that you are fully familiar with the requirements the casino expects you to fulfil. You will need to wager your bonus money 40 times before you ‘re allowed to withdraw your winnings as cash. Winnings from your free spins have a 20x wagering requirement and a validity of 30 days. The operator goes all out when it comes to their games selection, and in fact, the games are powered by the best software suppliers in the industry. Names like Microgaming, IGT, NetEnt, Yggdrasil, NextGen Gaming, Quickspin and Play’n GO are familiar to slot and casino game fans and to this end SuperLenny does not disappoint. The software uses the latest in instant play technology combining HTML5 with Flash, and players will not have to download any apps to start enjoying their favourite games. Loading times are fast and games can be filtered to only show a specific category, a useful feature for customers who know exactly what they want! Moving beyond the hundreds of slot games, a list that only grows monthly as new games are added, there are also some other casino options. 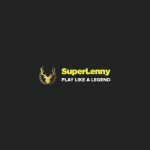 SuperLenny has a very exciting Live Dealer Casino with over 43 tables including Blackjack, Roulette, Baccarat and Texas hold’em. Powered primarily by Evolution Gaming, with a license granted by the Alderney Commission for Gambling Control, NetEnt also adds its own unique tables into the mix. There are also over 60 video poker machines and other games include Bingo, Scratch Cards and Keno. The Sportsbook is operated by Pronzo Entertainment B.V. and is regulated by the gaming authority of Curacao. SuperLenny takes mobile gaming seriously and players who opt for this option will be happy to know that hundreds of the slots available for desktop can be played on an optimised mobile website. There are an impressive 190 slot games available, 9 Video Poker games, 3 Roulette wheels and 11 variants of Blackjack. Mobile gaming has been developed alongside the desktop version of the website, so no app for Apple iOS, Android or Windows are needed. All the games are stocked using html-5 and flash software and are all available as instant play. All the games are available within the web browser app on the tablet or phone and compatibility is perfect. The mobile friendly casino at SuperLenny opens automatically when you access the page, and regardless of whether you use Google Chrome, Firefox or Safari, it works perfectly. The landing page is in the form of a grid and features some of the most popular slot titles. If you know which game you want to play, use the search bar at the top of the page. An online casino company can’t legally trade unless they are registered with a reputable regulatory body and SuperLenny meets all the strict standards expected of a top online casino by being licensed with the Malta Gaming Authority and the UK Gambling Commission. If you look around their website you will find an ‘RNG Certified’ seal which proves that the games featured at SuperLenny are completely fair and random and more than that, leading independent company eCOGRA conducts regular tests to calculate the return To Player rate of the games and ensures games are fair and random with the same odds for everyone. When you register at SuperLenny, you will be handing over sensitive information like your personal details and financial information. You can feel secure knowing that SuperLenny is completely encrypted and your information is protected. Here you’ll find Transport Layer Security 1.2 encryption which guarantees that the connection, including the transfer of information, remains private and unobtainable by third parties. Customer support is available Mondays to Sundays from 9am until 11pm. If you have queries you can reach the team via email, which is [email protected] Usually emails take a few hours to be answered so if you need a much faster reply, contact them on the live chat which is available directly through the website. There is also a telephone line available for those people that enjoy picking up the phone and speaking directly to a member of staff. Their telephone number is 0044-8008085264. SuperLenny Casino has tons in its favour, starting with its website layout which is super easy to use and navigate. With over hundreds of games that can be played from the site with no download needed and we are sure that casino fans are in for a treat. This is a casino that offers an all-in-one service: They have a strong sportsbook covering a large variety of sports and thousands of markets, and even an acceptable selection of esports to bet on. Their casino is also impressive with hundreds of slot games, table games, video poker games, and Live Dealer games provided by the leading software providers. To make things even more exciting, the lucrative Welcome Bonus and huge selection of casino games coupled with a knowledgeable customer service team makes SuperLenny casino super and highly recommended!